82 days. (Indeterminate) [This old Virginia variety won the Grand Prize for size and quality at the Jamestown Exposition held in 1907 at Sewell’s Point, VA.] Large, meaty, pink-purple fruits can reach 2½ lbs. or more when well grown. 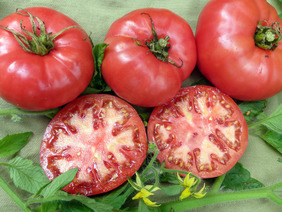 Often preferred by gardeners wanting large, “low acid” pink tomatoes that have a high sugar content. Thick skin - a useful quality in a canning tomato, and one that offers some protection against fruit worm. Pkt.